It's here! One full month of baseball. The season started on April 5 and here we are sitting on May 5 - Cinco de Mayo! Man, if I had some latin-version packs to open, today would be a great day for it. But, I don't. So, we raise a glass and pick a pack: 1986 Donruss ML All-Stars. Oh, to clarify yesterday's blurb about unclaimed cards - any dupes, trips, etc that go unclaimed (that is, they are left over after any possible collation) will be distributed among all participants as well. Checklist - Really? Sorry, folks. Man, checklists should NEVER count as one of the cards in a pack. 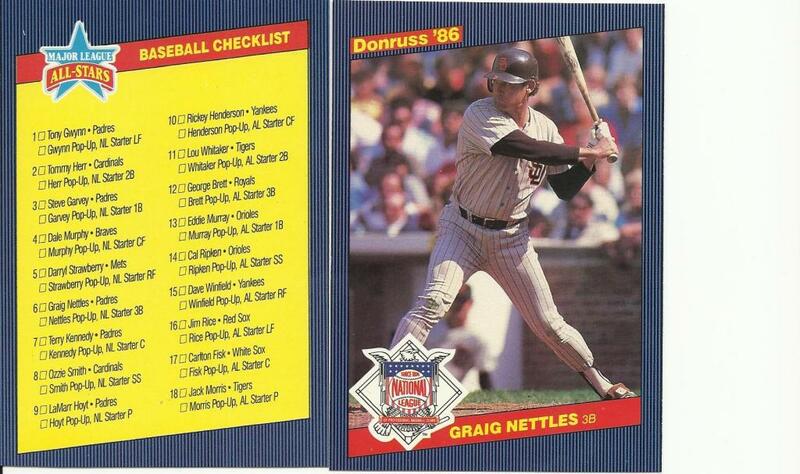 When I was a kid, and I'm sure I've told you this before, we used to trade checklists based on what players' names were on it - Mike Schmidt on the list? That was as good as having a Schmidt card in hand. We were simple kids. Sweet! 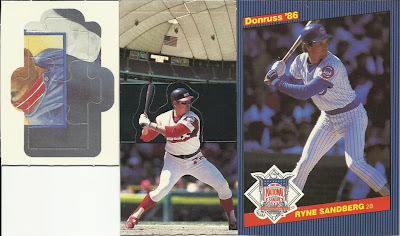 A Ryno I need for the collection!